Condensed-matter physics concerns atoms in close proximity to one another and interacting strongly, as in the liquid and solid states. Collective and cooperative phenomena that result from these interactions can produce a variety of unusual physical properties as represented by the superfluid phases of 3He or high-temperature superconductivity. 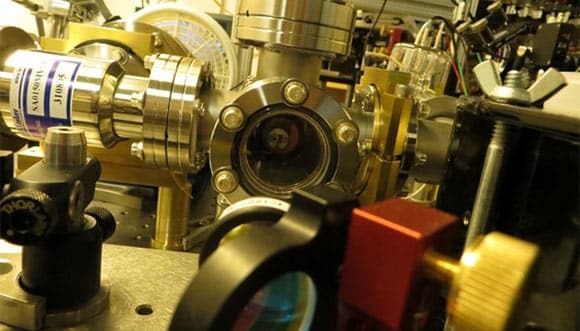 Research areas of particular strength at Cornell include nanostructure physics, correlated quantum materials, low-temperature physics, x-ray physics and soft condensed matter physics. Nanostructure physics was pioneered at Cornell, and we remain the leader in this field because of a unique and continually updated collection of advanced tools at the Cornell NanoScale Science & Technology Facility (CNF). Physicists at Cornell developed many “top-down” lithography techniques, now capable of building structures on scales less than 10 nm, as well as “bottom-up” guided-assembly techniques for incorporating nanometer-scale objects into functional devices. Current work involves understanding the effects of quantum mechanics on electron transport in carbon nanotubes, graphene and individual organic molecules. Nanometer-scale magnetic devices are an area of emphasis, with applications for using spin-polarized currents to control ultra-dense magnetic memories. The dynamics of high-quality mechanical oscillators made of silicon, silicon nitride, carbon nanotubes and graphene are approaching quantum-mechanical limits and can act as extremely sensitive force sensors in a wide variety of experiments. The department is heavily invested in continuing to invent new tools to further understanding, including entirely new forms of scanning-probe microscopy for use in characterizing phenomena on the nanometer scale. In correlated quantum materials, quantum many-body interactions between electrons or atoms play a key role in determining physical properties. These interactions can give rise to fascinating electronic or magnetic states such as high-temperature superconductivity or colossal magnetoresistance. In dilute gases of ultracold atoms, interactions can also allow the creation of entirely new forms of quantum matter. One of the major research thrusts at Cornell is in studying exotic superconducting materials, such as the cuprates, pnictide, ruthenates, or heavy fermion families. “Tunable” quantum materials are being explored, in which electronic interactions can be manipulated through external knobs such as epitaxial strain, interfacial engineering, or carrier concentration. To carry out this research, state-of-the-art techniques such as Spectroscopic-Imaging Scanning Tunneling Microscopy (SI-STM), Angle-Resolved Photoemission Spectroscopy (ARPES) and x-ray spectroscopies are developed to image the electronic wavefunctions in both real space and momentum space. In atomic physics, the focus is on quantum fluids made from atoms with spin, which can simultaneously exhibit properties of both superfluids and ferromagnets, and the use of atomic gases to develop an ultrasensitive microscope for imaging magnetic fields on micrometer length scales. Since the discovery of superfluid 3He at Cornell (for which Richardson, Lee, and Osheroff won the Nobel Prize), superfluid helium systems have become model systems for testing a wide variety of interesting theories. Current research in low-temperature physics focuses on potential supersolids, studies of superflow along grain boundaries in solid helium, the effects of disorder and confinement on superfluids and their quantum phase transitions,and the development of new cooling technologies for space-based applications. High intensity x-rays produced by the Cornell High Energy Synchrotron Source (CHESS) are used in the Physics Department (and by a national user community) to study the growth modes of metallic thin films used in electronic devices, motion of charge-density waves in quasi-one-dimensional metals and the dynamics by which polymer materials self-assemble into controlled structures. New regimes of study are being opened with the development of high-speed x-ray detectors for probing time-dependent phenomena. Cornell is also pursuing a major expansion in our facilities, with planning underway for the design and construction of an Energy Recovery Linac x-ray source that should enable powerful new techniques in x-ray microscopy, coherent diffraction and time-resolved studies. Soft condensed matter physics deals with liquids, polymers, liquid crystals and other ’squishy’ materials that are central to biology and many industrial processes, and which could provide new applications based on their capacity to self-assemble into complex structures. Colloidal materials made of micron-sized polymer spheres in solution are being studied by confocal microscopy to see directly their correlations within both the liquid and solid states and to study the mechanisms of crystal growth at the level of single particles in real time. The process of understanding protein structure and function is limited by the bottleneck of making crystals of purified proteins for X-ray diffraction – we are studying the fundamental growth modes of protein crystals and their intrinsic defect structures with the goal of enabling better understanding of biological function. The physics of insect flight is also being investigated using high-speed photography together with large-scale simulations of the interactions between air flow and wing.